Watercolours, Copic markers, and gouache on watercolour stock. That is so beautiful! I love the little kitten playing with the string at the bottom. :) Not to mention the beautiful colours and textures throughout. A wonderful piece! Amazing work. The colors are beautiful. *hugs you silly* Thankyou, Marquise!! Oh, that's just beautiful - as always!! 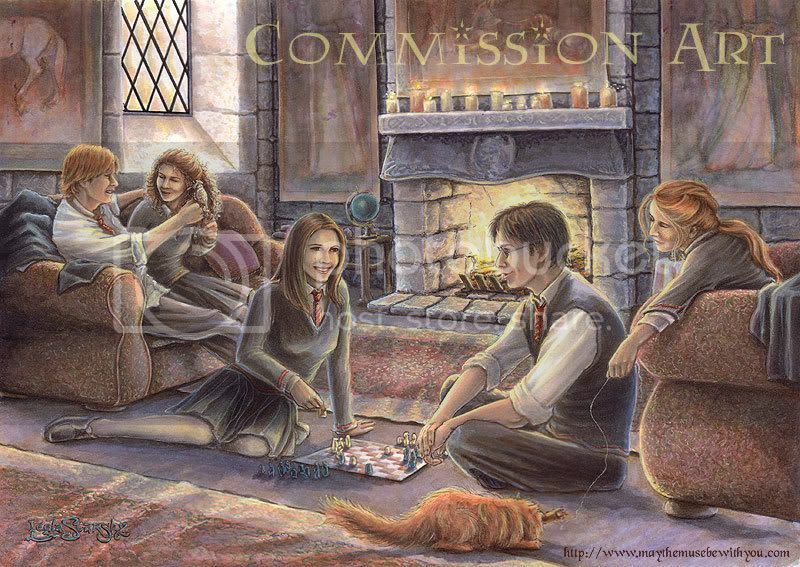 Wouldn't we all live to spend some time in the Gryffindor Common Room? Glad you enjoyed the pic! You've been a busy girl! Gee you're clever. Whoa. So much detail. Even down to the little ripples in the rug. Beautiful work! I am seriously 'flat out like a lizard drinking!' ;~P Glad you enjoyed it, Sarah. That's amazing! I'd love to watch you work sometime! Thanks! And ditto! I love seeing how other artists work!